Acura gets a lot of flack around here, and most of it for good reason. They were once a brand both respected by enthusiasts and folks who desired a quality luxury car but didn't want some of the baggage that comes with ze Germans. Then Acura killed all the cars loved by Jalops: the Integra, the RSX and most sadly the NSX. There was a glimmer of hope for a while with the 2nd generation TL, but then that glimmer went dark with their new corporate "beak," and the brand has been stumbling ever since. The all new TLX sedan is supposed to be a revival for Acura as a serious alternative to the established luxury players. No one knows yet how the product will be, but from a pricing standpoint it appears they have already lost. But pricing hasn't been released yet! One (1) winner will receive a 2015 Acura TLX Advance SH-AWD. The approximate retail value ("ARV") of the prize is $49,995. Now 50k, doesn't sound too bad for a fully loaded SH-AWD with Advance package. I would like to mention that I've always appreciated Acura's tired trim pricing. 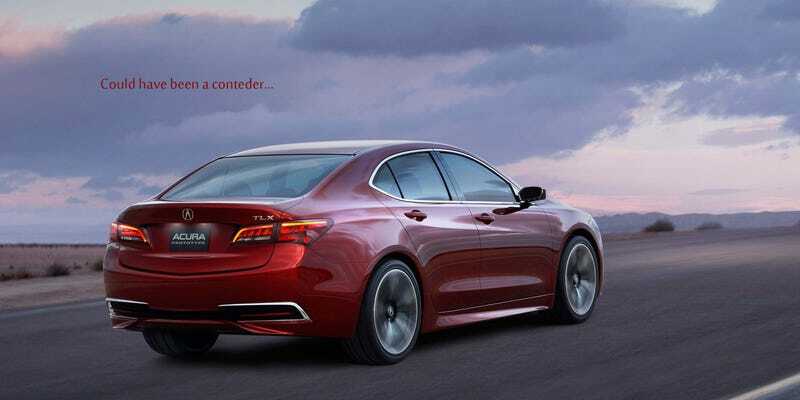 However, despite the value that Acura is offering the TLX is set to be priced about 5 thousand more than a current generation TL SH-AWD with Advance package. Also keep in mind that the TLX is supposed to be a replacement for both the TL and the TSX (hence the combination of letters). I don't know about you, but I was hoping for some kind of middle ground between the two retired cars. It is this overly ambitious pricing that could torpedo the TLX from the start. If we just compare the top tier TLX, I wonder what else can be had for around 50k with 300hp and AWD? That would be the bogey of every luxury car maker, the BMW 3-series. A 335 xDrive starts at 45,400. Of course when you load it with the same equipment of an Advance TLX you hit about 53k. But remember, 50k cars are not bought they are leased. A 3 thousand dollar difference in MSRP does not make a drastic impact on lease payments, especially when BMW offers serious incentives for lessees. Also keep in mind that most people are perfectly happy with the performance of a 328 xDrive, which loaded with similar options will set you back about 50k even. That's not fair the TLX is not in the same class as the 3, it will be bigger! Perhaps, but will it be bigger where it counts? Like I mentioned before the TLX is supposed to replace both the mid-size TL and the compact TSX, so I would imagine the dimensions would be somewhere in between the two. But let's say the TSX holds the same interior dimensions as the current TL. Sure the TL is a much larger car, but if you examine closely the interior dimensions to a 3-series they are very close. The numbers become even more interesting when you compare the F30 3-series, the TL, and an F10 5-series. It really makes you wonder why people "need" the larger 5-series. Anyway back to the TLX, Acura needs to overcome both badge snobbery from the usual luxury buyers and cross-shopping from performance types like us. This is not a good place to be in for the brand. Acura was once the reliable, sporty, and affordable alternative to BMW and Mercedes. When the TSX went up against the E90 it was similar in size, but despite not having the same caliber of performance the TSX was a joy to toss around (especially with the 6-speed manual), very reliable and much cheaper. The TSX was the car you bought because you couldn't afford the 3. The TLX is the car you get instead of the BMW; the problem is there are already plenty of of "alternatives" to the 3 series. In order for the TLX to succeed, Acura either needs to make the best sport-sedan IN THE WORLD, or seriously reexamine their pricing strategy.